Moon Position: 0°00’00" – 12°51’26" Libra Moon Sign. The desire for personal and spiritual freedom, independence and self-reliance. Free-thinking and free-thinking. Spiritual often prevails over the material. Favored to search for treasure and treasure, both materially and spiritually. Strong intuition, business flair, commercial ability, agility in handling finances. Sociability, charity. The ability to achieve a high social status, acquisition of state in the form of real estate or investments in companies. A comfortable old age. This provision protects the people who are in misfortune, whose great sorrow and who need moral and material assistance. If this is the house of the Lunar Ascendant, the distinctive traits are spiritual gentleness, kindness, integrity, compassion and mercy. These people are careful, cautious, cleverly bypass all the "rough edges", try to avoid controversy and confrontation. In cases they are slow, all carefully consider, but, despite this, in commercial matters they are lucky. 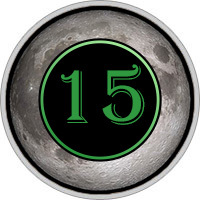 1st Quarter of 15 Moon House. Boldness, courage, risky, even dangerous enterprise. Part of the appeal, oratorical gift, eloquence, vivid expression scientific vocation, the ability to lead people, manage a large number of subordinates. And in science, and in the profession always have credibility. 2nd Quarter of 15 Moon House. Unfavorable. Many mysteries and secrets, communication and business doubtful, questionable means earning very dubious reputation. 3rd Quarter of 15 Moon House. Glory, honor, respect, popularity and fame. 4th Quarter of 15 Moon House. Unfavorable. Often questionable companies, immoral life, passion and addiction prevail over prudence.